*3 month commitment: Monthly Membership will auto-renew under the same terms each month for a minimum of 3 months. To cancel your Monthly Membership, please email info@thepursuitstudio.com 14 days prior to your next billing cycle. *Class Packages expire in 6 months. *Group privates and charter sessions also available. 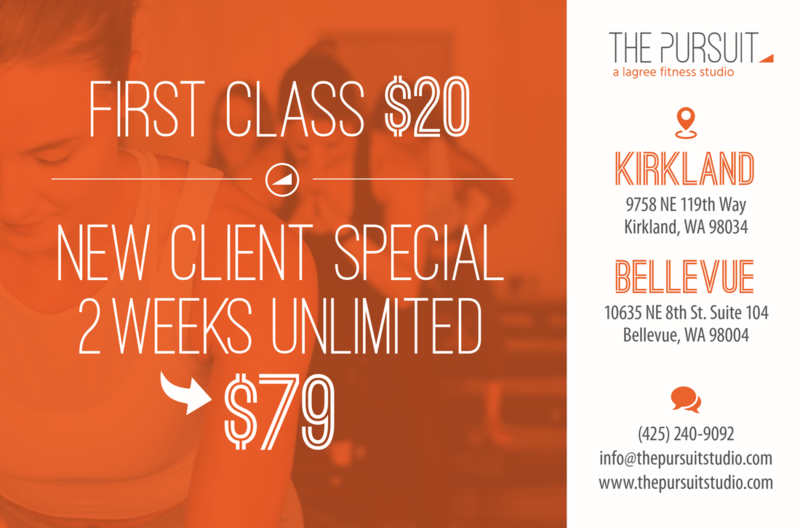 For more information, please contact us at info@thepursuitstudio.com. Group classes require a 12 hour cancellation notice. You may cancel reserved classes for any reason without penalty up until 12 hours prior to the scheduled class. Classes cannot be rescheduled for a different class time within the 12 hour window, and we reserve the right to cancel any class. Classes cancelled within the 12 hour window are considered "late cancel", and classes cancelled within 1 hour of class are considered "no-show". All cancellations must be done online. Monthly Unlimited members: Unlimited memberships will be charged $15 for late cancel and $25 for no-show. Class Package members: Cancellations within 12 hours will forfeit the class, and no-shows will result in an additional $25 charge. Private/Duet Sessions: Cancellation is required 24 hours in advance. Cancellations within 24 hours will result in a $25 charge, but the session will remain on your account. No-shows will result in forfeit of the session. All sales are final. Memberships and packages are not eligible for refunds, transfers, or exchanges. Instructors and classes are subject to change without notice. Clients must be 18+. We are a cashless studio and accept Visa, MasterCard, and American Express.